A United States Navy F/A-18 jet belonging to the Blue Angels demonstration team reportedly went down in Smyrna, Tennessee this afternoon. The incident does not initially appear to be tied to an earlier crash of a U.S. Air Force Thunderbirds demonstration team jet. The pilot reportedly died in the incident. 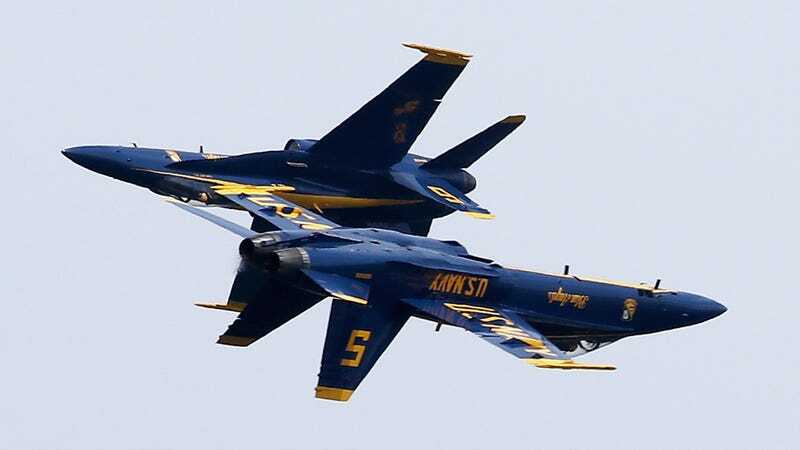 A U.S. Navy Blue Angels jet crashed after takeoff during a practice flight around 3 p.m. Thursday, according to a reporter at the scene who witnessed the crash. A fireball and thick black plume of smoke could be seen just beyond the runway at Smyrna Airport and from Interstate 24. An eyewitness told WKRN that it does not appear as if the pilot was able to eject. After the aircraft took off, one of the solos was low when conducting maneuvers, and began to stall when it was completing a loop. The witness added that aircraft number five was the one involved in the incident. UPDATE 6:30 PM: The pilot was the one reportedly killed in the incident. The name has not yet been released, pending next-of-kin notifications. UPDATE 8:09 PM: The pilot killed in the incident was Captain Jeff Kuss, a father of two who joined the Blue Angels in September of 2014 according to Channel 5. UPDATE 8:34 AM, JUNE 3rd: Kuss was the pilot of aircraft number six. This update also corrects the site of the crash to more accurately place within Smyrna, Tennessee.